The map is referred to as the Martellus map. It is named after its creator, the German cartographer Henricus Martellus, and is thought be have been produced in or around 1491. The only known surviving copy lives at the Beinecke Library at Yale. 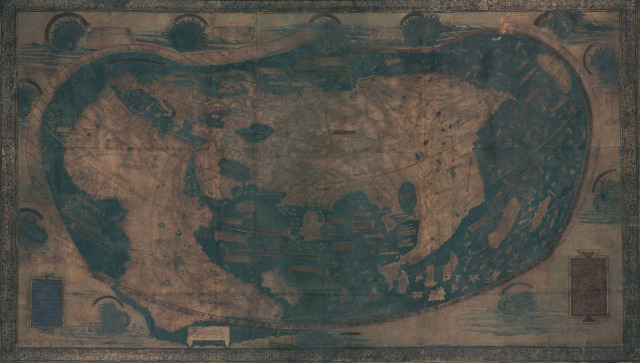 Being a large wall map, it is 4 by 6.5 feet, and having survived for over 500 years it is understandable that the map has seen better days. The map, which is usually on display by Beinecke’s service desk, has been relatively unexamined following a peak in interest after its acquisition in the 1960s because it is largely illegible. 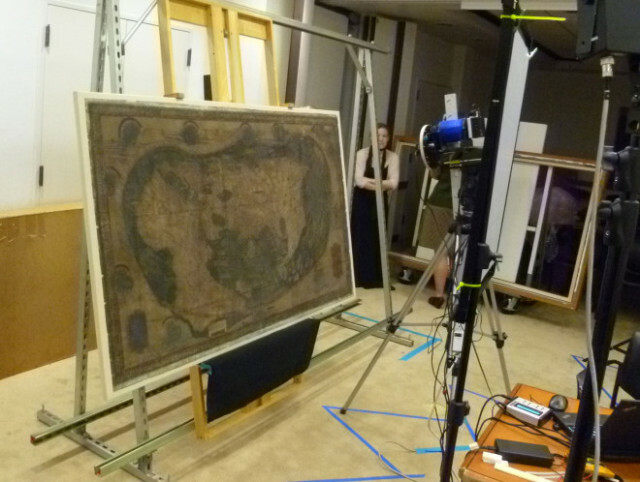 Now thanks to a new technique called multispectral imaging it just might be possible to unearth the map’s text that is buried under all that wear and tear inherent in its age. Setting up the map for scanning took two and a half days. Scanning the map took another day. The team used an automated camera system developed by a digital imaging company called Megavision. The system uses LEDs to deliver light within a narrow band of wavelengths and minimize the amount of heat and light the map was exposed to. The camera has a quartz lens, which transmits ultraviolet light better than glass. The team photographed 55 overlapping tiles of the map, using 12 different types of illumination, ranging from ultraviolet to infrared. Then the experts go to work trying to decipher. They hope to finish up sometime next year.